Indian tennis legend Leander Paes, who is India's most decorated player with 18 Grand Slam doubles titles, admits that the learning process is very much on at even this stage of his career. Some sportsmen who have reached the pinnacle of their careers after winning almost everything there is to offer in their sport, never seem to shy away for achieving more glory. Indian tennis legend Leander Paes, who is India's most decorated player with 18 Grand Slam doubles titles, admits that his learning process is very much on at even this stage of his career. Earlier in the day, he said that by just watching Spanish great Rafael Nadal train and play, its a tremendous coaching manual for fine tuning your tennis skills. The 43-year-old, whose longevity is a talked about tale in world tennis, said the line-up that Spain has announced for the Davis Cup tie against India is a must watch for every single budding athlete in the country. Spain have come with 14-time Grand Slam champion Nadal, world number 13 David Ferrer, the marathon man of world tennis with 26 ATP singles titles, and French Open champion pair of Mark and Feliciano Lopez. "It's a great showcase of tennis in India. If I were 9,10, 15-year old budding athlete, I would be packing the stadium, every single day. To come and watch a 14-time Grand Slam champion is unbelievable. For me even now, at this stage of my career, where I have played 30 years, you can come out and watch what Rafa does and learn so much," Paes said. "You can learn about the footwork, about the power, the generation of shots, the follow through, the swing the rituals after the practice," Paes said elaborating. "Spanish team to me is one of the most professional teams. They fight together. I can't say enough of respect I have for this team, starting with Rafa, one of the greatest. I am lucky I got a chance to play doubles with him (in Paris Masters, 2015). It's not just about how he plays tennis but the way he conducts himself. He is a great ambassador of the game," he said showering encomiums on the Spanish great. Now this has come from a player, who has completed Career Slams in both men's doubles and mixed doubles and has competed in a record seven Olympics with a singles bronze. 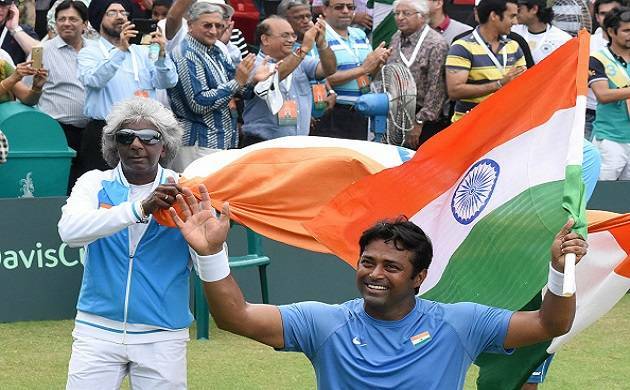 Paes, who is just one win shy of becoming the most successful doubles players in the history of Davis Cup, said India's singles players -- Saketh Myneni and Ramkumar Ramanathan -- have a great opportunity to test themselves against the best in the world. "You have nothing to lose. You have got us here (World Group Play-off stage) and we are proud of that. You have crossed this hurdle at the US Open and now playing greats of the game. (you need to find) How does my game match up with them. You can watch how Ferrer moves on baseline, how Rafa plays that forehand. Most people worry about winning or losing, but at end of the day you need to keep improving," Paes, tied with Italian great Nicola Pietrangeli on 42 doubles wins, said. Pietrangeli also holds the most singles wins record in Davis Cup with 78 victories in 66 ties. Paes said his job in this tie is to nurture the next generation and he indeed is "leading by example". "I was first on the court and last to leave. I hope kids on the team saw that. My volley is not bad but I am still working on that with my coach. The drill I generate, hitting down the line, backhand, cross-court. More than the talk, it's action." Paes also made it clear that the young players such as Sumit Nagal, need to learn and move to the next level fast. "Can Sumit Nagal after winning junior Wimbledon, spend three days with me and absorb a few things. Before the next tie, he needs to improve. If we are working on the same thing in February too then...Davis Cup is a learning curve," he said. Asked who he would like to play doubles with -- Nagal or Myneni -- Paes said he won't make any preferences. "I am ready for anybody. I have played through nine generations of players and hence whoever they put me with, I am ready. It does not matter. My job is to nurture the young players," he said. Paes also made it clear that the next generation players need to push him out of the team and earn their place. "Let the juniors come up and surpass me, and say Lee you don't have a spot, I will sit down. Part of my responsibility is to pass on the knowledge. I push them like hell. I am still beating them in games, what's going on. That's a practice and not match."